Welcome to the 19th edition of the Pyro News. In this edition I'm announcing that all AUSTRALIAN and NEW ZEALAND burners can take advantage of a special offer during the month of February. I bought a large lot of Razertip equipment when the Aussie dollar was particularly strong against the Canadian dollar. As a result I am offering ALL RAZERTIP stock for 5% off the normal cost. This will apply to all Razertip Stock bought and ordered in the entire month. The way the market is fluctuating this may well be a one time offer so take advantage of it while you can. I continue to experiment with burning on different materials and in this issue of the Pyro News I share my bone burning results with you. I've produced a 6 minute DVD on the experiment and I've also included all the steps in captions below, so you can print it out to keep. I've also managed to get the Pyrography Artist Registry up online. 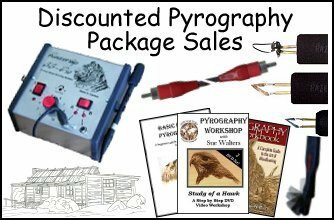 This registry is intended to showcase pyrographers who are keen to be hired to burn. It's totally free and so far 24 pyro artists have put their hands up to be included. If you wish to be included, please use the signup form below. Australian and New Zealand Razertip Equipment Sale. All Australian Razertip Equipment will be reduced by 5% for the entire month of February. The Australian Dual Razertip Burner. $271.65 AUD for the month of February. 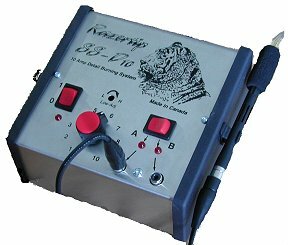 Sue Walters Pyrography has the largest range of Razertip equipment in Australia. It's the burner I use and it's the one I sell. For the month of February I am offering the entire range of Razertip stock at 5% off. 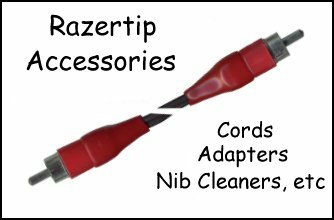 If you want to have a look at my large Razertip range please click on the pictures and links below. 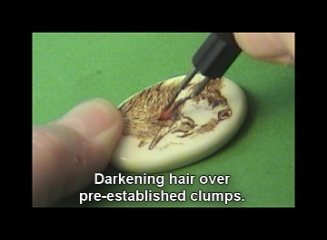 >Q: Sue Walters Pyrography already has the lowest Razertip prices in Australia by far, so why 5% off? A:I bought bulk while the dollar was just right so, instead of pocketing the bonus, I'm passing it on to you. Q: I'd like a Razertip Burner and pens but I'm a little daunted. What is the best basic setup? I don't want a thousand pens, but I want to be able to burn a lot of subjects. Can you make a recommendation? A: For decorative burning I believe a huge variety of burning can be accomplished by using just 3 types of tips: A skew, a writing tip and a shading tip. These 3 tips have 3 distinctive profiles and each burns a unique impression or mark in comparison to the other. 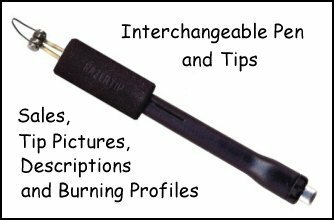 A combination of these profiles are more than enough to allow the pyrographer to burn any type of picture. With this in mind I tested a lot of pens and came up with the 3 I believe to be the most versatile of these pens. As a result I developed the Basic Burning Package. This is an extremely popular setup and I base it on my own. The Basic Dual setup consists of: Dual burner, 2 x heavy duty cords, HD30M spoon shader pen, HD14M skew pen, F99.015 ball writer pen, Pyrography Nibs & Their Use DVD. This package is normally $373.90. During February you pay $355.20 AUD. Q: Can you give me advice on what to buy to suit my particular needs? A: Of course! If you have any questions just EMAIL SUE and I will help advise you...it's all part of the service. Q: Are Razertip Burners specially made for Australia and New Zealand? A: They certainly are! Razertip makes the burners to suit our power and plugs...in fact they took years to perfect these burners and earn a C-Tick rating. No other North American burners sold in Australia have the C-Tick. This is something serious to consider. Q: How will you apply the discount? A: If you use MasterCard or VISA cart buttons on the web site we will apply the discount for you manually, when the order is received. If you pay via the PayPal cart button you will get a refund sent to you via PayPal. If you are quoted or make a phone order we will apply the discount at the time of sale. Q: Will the 5% off Razertip Equipment be applied to the Package Deals already offered? A: Yes. We offer 30% off all Sue Walters products when people buy a burner from me. That's why the package deals are so good. Not only will you get the usual 30% off, but we will also take 5% off any Razertip products in the package. Q: Will the shipping remain at a flat $10.00 AUD fee, no matter how much I buy in my package? A: You will NEVER pay more than $10.00 AUD for shipping within Australia when buying a burner package. All products in that package will be combined under the $10.00 shipping umbrella. 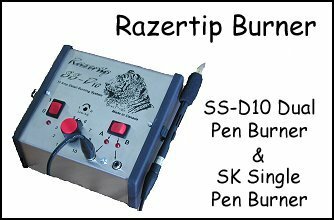 Q: Can you custom make burner packages and will the 5% apply to the Razertip equipment if you do? A: We commonly make up special packages for our customers. Some like a certain package but want some things removed...some things added...or a combination of both. Some people want pen changes or have a specific list of exactly what they want. All you need to do is tell us what you want in your package and we will send an itemized quote back. All of the usual 30% discounts will apply to Sue Walters products and the 5% discount will be applied to the Razertip equipment contained in the package. Q: If you run out of stock or I want to special order anything in, will the 5% still apply? Q: I'm from New Zealand. Do I have to pay more for shipping? A: I'm afraid so. We strictly charge the people of New Zealand exactly what Australia Post charges us. There are no hidden 'handling fees'. If you use a cart button we will contact you and let you know the extra shipping charge. You can cancel the order if you are unhappy with the extra. If you are getting a quote we will tell you the shipping at that time. Q: What is the warranty on the Razertip equipment? A: 3 years on the power base, 1 year on the fixed tip pens, 90 days on tips. Q: Do you handle all warranty issues in Australia if something should go wrong with my equipment? A: Yes, contact me in the unlikely event something goes wrong and I will deal with the problem from within Australia. Even if you accidently break a pen, I'll replace it. Burning on bone presents its challenges but I found the experience well worth the challenge and look forward to doing more in the future. Perhaps the greatest drawback of this material is in the messy preparation of the bone. Did I say 'perhaps'? Okay, definitely, by far, without doubt, the biggest drawback of bone burning is the stinky, time consuming preparation. But I confess that the little ivory like gem that presented itself at the end of lengthy preparation filled me with the promise of what could be. 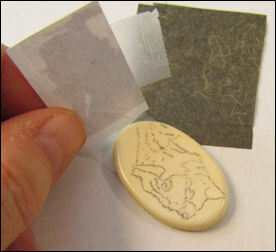 The material was creamy coloured, super smooth to the touch and had a weighty quality. For my project I selected thick beef bone that I found at the butchers. 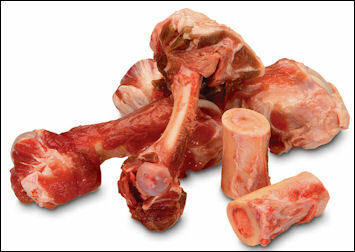 Check out the dog bone or soup bone section of your local meat shop and you should easily find the same. I'm sure other bone could be burnt on as well, but that will have to wait for my next bone experiment. I chose beef for this project based on the thickness of the bone wall and the readiness of supply. I decided to burn a portrait of a bison. I wanted to push the high realism envelope to see just what could be done on bone but there is no reason that more simple designs could also be used. Celtic, art deco and art nouveau designs immediately come to mind. My overall impression is that bone burning is similar to ivory burning. A very hot tip is required and it can be a sticky burn at times. Having said that, I think the pros far outweigh the cons for the more adventurous burner. 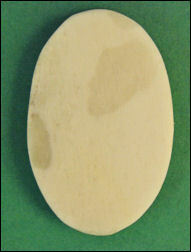 The material resembles ivory but, in comparison, it is readily available and many shapes can be cut from it. The resulting burn has a lovely sepia tone, contrasting handsomely with the shiny cream canvas. Even though the size of bone work is somewhat limited it is perfect for jewellery making, inlay work, pen work, gourd work, free standing shapes,, belt buckles, tree ornaments and numerous other objects and applications. What are you waiting for?? Fight Fido for his bone, whack a peg on your nose and let's get burning! You can click the link above to view the video on YouTube or you can view it on the player below. 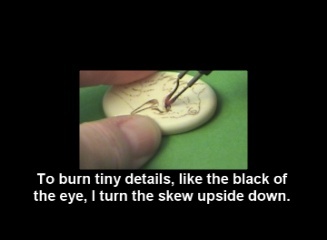 On the player you can also view 5 other free pyrography snippets that I have produced: Erasing Woodburning, Using the Spoon Shader, Burning a Gourd Quilt, Ivory Burning and The Tea Strainer Tip Cleaner. 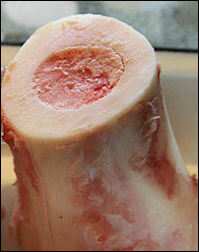 Select beef bone that is thick enough and has enough area to cut your shape from. Cut the bone down to size if it's too big. You could ask your butcher to do this or you could use something like a bandsaw. 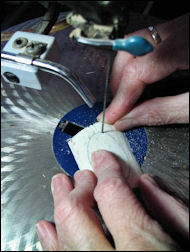 After you have cleaned the bone trace the project shape onto the bone surface. I used graphite paper and hard pencil. 5: To get the shape I wanted, I used a Microsoft Word program. I simply used the program to insert an oval shape and dragged the corners until I was happy with the size. I then printed my design to use as my pattern. Any number of Text or Image programs can be used to create all sorts of shapes to cut out of your bone. I next used a flat sander to flatten the surface but you could certainly leave it curved if you wish. You can see here the bone is still somewhat discoloured. 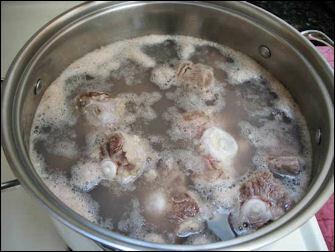 To bleach it to a bright creamy colour I then soaked the bone in a mild solution of hydrogen peroxide. Rinse and then allow your bone to thoroughly dry in the shade. 9: I then polished the surface of the bone using a Dremel and Aluminium oxide paste. Blocks of Aluminium oxide can be readily found in most hardware stores. (It will probably be called Aluminum oxide in the States and Canada.) You could also use other polishing products such as white rouge and white cream toothpaste...just make sure the product is white in colour or you may stain the bone. 11: A few years ago I had the great fortune to be able to travel to both Dakotas with my friends Barb and Frank Kaminski. There I was thrilled to witness tons of wild animals, including buffalo. I cropped one of my photos with imaging software to use as the pattern for my bison portrait. I reduced the size of the image and taped the printout to the face of the bone disc. This tracing gives me the very basic shape of the animal and I then freehand burn all the rest by referring to a second print out and the original reference on my computer. I've often been asked if I trace my design or hand sketch my design. I happily admit I have been blessed with good drawing genes and I don't struggle with realistic freehand drawing and scaling a reference picture...(I do high realism drawing and painting in what, I laughingly call 'my spare time')...but let's face it folks, life is short and I'm impatient to start burning. So, the answer is I often trace the outline and main portions of my design as a guide before burning. I can also honestly say that I see absolutely nothing wrong with people using patterns; their own or others. 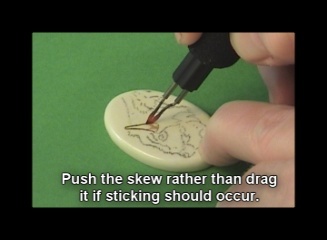 Every other craft uses patterns so why not the burner? After all, we're here to have fun. 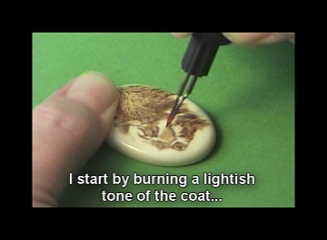 In my book the idea is to get from the light bulb to the finished project, with as little pain as possible. 13: The resulting traced design is fragile to the touch. 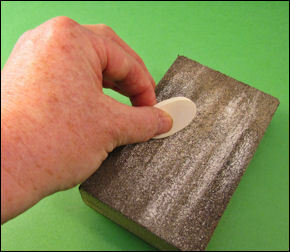 It will rub off very easily with straying finger tips, so do be careful. Because the tracing was so easily erased I decided to go over my tracing and burn the entire outline first. Here I am outlining the longer hair with a skew. When burning longer lines like this I immediately noticed that the skew tended to 'stick' and not glide smoothly. 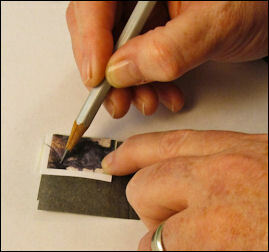 15: I found that the sticking resulted in some patchy, uneven lines. I remedied this by going back over the lines and stabbing the blade in the places left unburnt. 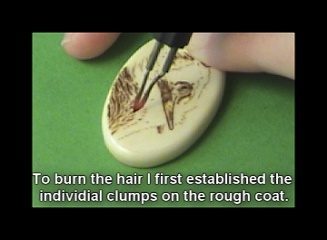 17: Remember; don't use a solid, unbroken line when edging hair that is fluffy or shaggy. Doing so makes the subject look very unnatural. 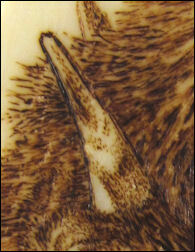 18: The bison's hair sticks out, so, use staggered, broken strokes to burn the outer edge. 20: I also defined the main groups of hair with staggered, broken strokes. The length of stroke is in direct proportion to the hair length I'm seeing. This or course has to be done to scale. 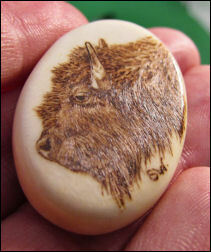 This buffalo head is very small, so if I'm burning short nose hair then my lines are so short that they are almost dots. I then lengthen my strokes in relation to the length of hair...the longest being the shaggy beard. The unruly bison hair was a bit of a challenge. I decided to burn in the individual clumps of hair first...concentrating on the patterns they make rather than being distracted by individual hairs. 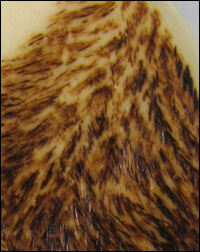 22: You can see the burnt clump pattern in this close up. Notice how each clump is made by burning a series of random, staggered lines. They all go in the general direction of the coats flow, but they are not a collection of straight tram tracks. A solid clump, with the lines all running the one way would look unnatural. The staggered lines help loosen up the coat and give it some 'wild' life. 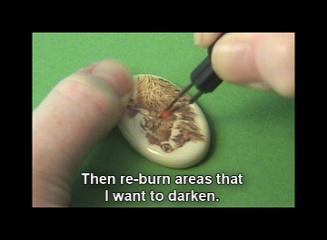 23: Once I had established the general coat pattern I could start intensifying some of the areas that needed darkening. 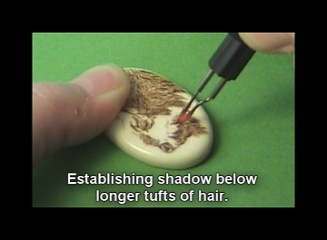 Protruding hair will create a shadow on the coat below. Areas of shadow are some of the places that I burnt darker. Creating shadow is one of the premium 'tricks' in portraying realistic objects. When shadow is cast by one object on another it shows depth and helps create three dimensional feel. 24: Note some of the areas of shadow: under the eye, under the muzzle, under the jaw, below the horn and in other various areas...particularly where the level of hair changes. 25: Some of the bison hair is naturally darker so I now go over those areas to add a little more darkness on the structure I've already formed. This also makes the shaggy protruding top coat stand out more. 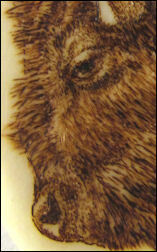 26: You can see how I've darkened some of the hair around the back of the neck. Darkening here also pushed this area to the background more and makes the Shaggy top coat appear to 'pop'. 27: The hair on the face is very short, so in keeping with this I keep my strokes very short...almost dot like. 29: ...then I gradually build the darker tones on top of this. I don't try and establish each of my total areas individually because I find this causes each area to stand out starkly compared to its neighbour. It's important to me here that the tonal areas are gradually built in overlapping layers. This allows for a smooth transition and blending of the different tones. 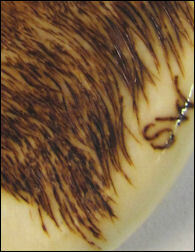 30: The area between face and the long hair of the shaggy beard is of a medium length. In keeping with my rule of stroke length I therefore burn these hairs at a length somewhere between the short facial hair and the long shaggy beard. 31: The area around the nose is one of the last I filled. The hair here is very short so my strokes were again very short. 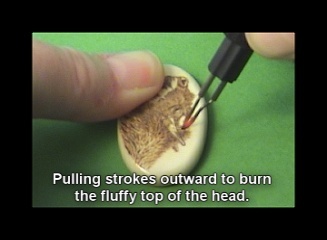 32: Lastly I burnt the fluffy flyaway hair of the forehead by pulling my strokes outward. At the end of these strokes I sped up my nib speed and quickly lifted off. This flicking at the end of the stroke produces a thin, tapering tail and that helps give the appearance of softness. 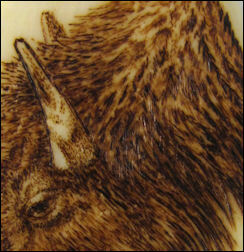 34: You can see by this close up how the tone on the horn has been built up by burning layer upon layer of tiny dots. Make sure you gradually build up to the darker tones...this gives a smoother transition between the various tones. There isn't much room on this piece to give the eye any detail. The main challenge was to sit it in a location that looked natural and to burn it as dark as possible. 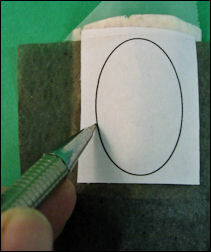 I inverted the skew and used the pointy tip to burn this small area. 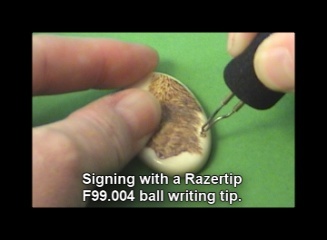 A mini ball tip or other mini writing tip could also have been used. 36: I found the best way to achieve near black on the eye and in the nostril was to rest the hot nib gently in place for longer periods of time. I kept repeating this until I got the colour I was after. I didn't push too hard because cooked bone can be brittle and I didn't want to chip the surface. 38: Because of the stickiness I found writing more difficult than on other materials. On wood you can burn letters without ever having to lift the tip off the surface. On bone I found I could only burn neatly by pulling the tip towards myself. 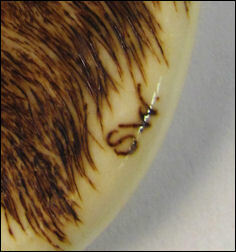 39: You can see at this angle how the skew leaves cut marks that help accent the texture of the hair. 40: A close-up of the finished buffalo. It doesn't matter if it's a small site or a large. All sites will be included as long as it's pyrography related in some way and has a links section. THE PYROGRAPHY ARTISTS REGISTRY is up and running. I see this place as a data base containing the following information: 1) Name of business/person 2) Location 3) Website, email or other contact information 4) Your pyrographic speciality, IE: pet portraits, gourds, colour, monochrome etc. 5) A little blurb about yourself. IE: what you like to burn or are happy to take on, location willing to ship to/cater to. 6) A picture of your best work or the work that best represents what you are trying to sell. This will be an absolutely free service. It's simply a bulletin board for pyrographic artists to advertise themselves. If you are interested in being listed in the PYROGRAPHY ARTIST REGISTRY then please fill in the form below or Email Sue.